Tonight’s National Night Out event will feature the debut of the new College Hill T-shirt. 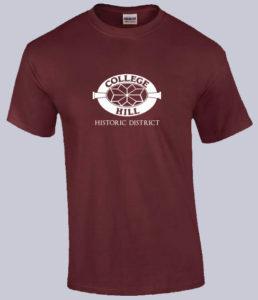 The vibrant garnet shirt with white logo is yours for just $15. Come in to College Hill Sundries to buy yours. The shirt was produced exclusively for the neighborhood association by our friends at Wear Yours on Tate Street. Also available in limited quantities: The very popular College Hill coffee mug. College Hill’s National Night Out will be held from 6 p.m. to 8 p.m. in the 500 block of South Mendenhall Street, with traffic blocked off from Morehead Avenue to Spring Garden Street. This entry was posted in College Hill Neighborhood Association, Mendenhall Street, Morehead Street, Neighborhood Watch, Public Safety, Spring Garden Street and tagged National Night Out, Wear Yours. Bookmark the permalink. Thanks Dave! we will get there early, so that we can get our size.